Slice avocado in half. Slice strawberries and mixed berries. Place in bowl aside. In a small mixing bowl, toss together slice strawberries and mixed berries with strawberry sauce recipe until well coated. 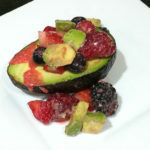 Add additional sliced avocado into mixture if desired. Spoon and serve over a half of avocado. Sprinkle with coarse sea salt to desired taste. Signup today to take your first step to a healthier you.